Samsung Electronics Co. on Wednesday unveiled a new mobile application processor optimized for artificial intelligence features that can be used on high-end smartphones and tablet PCs. A mobile AP combines central, graphics and video processing units, as well as a modem, into one and is used to run operating systems and applications. Accordingly, it is often referred to as the brain of mobile devices. 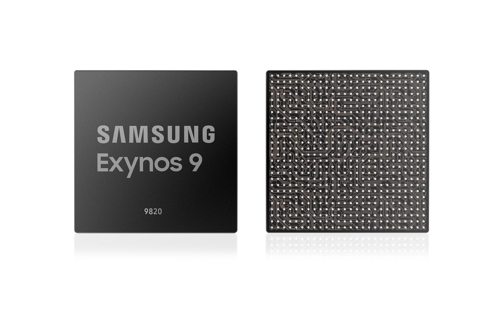 The South Korean tech giant said the Exynos 9 (9820) is installed with a neural processing unit that can carry out multiple computing without any delays. Compared to its predecessor, the Exynos 9 (9810), Samsung said the new product is seven times faster in terms of computing AI features. Samsung said the NPU will pave the way for what it calls on-device AI, which refers to AI features that do not call for connecting to cloud servers. This leads to improved security for users' private information, it added. The faster speed, moreover, allows users to better enjoy virtual reality or augmented reality content. When taking photos, Samsung said users can get better images as devices instantly calculate the shapes of objects, environment and brightness. Another notable feature of the new Exynos 9 is the fourth-generation CPU core developed by Samsung Electronics, which helps in improving performance and energy efficiency as well. Samsung said the new product is equipped with the Mali-G76 graphic processor, which comes with 40 percent improved graphic processing capabilities compared to its predecessor, while consuming 35 percent less power. The Exynos 9 (9820) is the industry's first AP to come with LTE Cat.20 8-carrier aggregation technology, paving the way for download speeds of 2 gigabits per second and upload speeds of 316 megabits per second. This indicates that a user can download 3.7-gigabyte full HD video in 15 seconds. The speed is significant as users can enjoy high-quality online gaming content without delay on mobile devices. As the new Exynos 9 supports all network standards from second to fourth generations, mobile devices equipped with this processor can be used anywhere in the world, Samsung added.